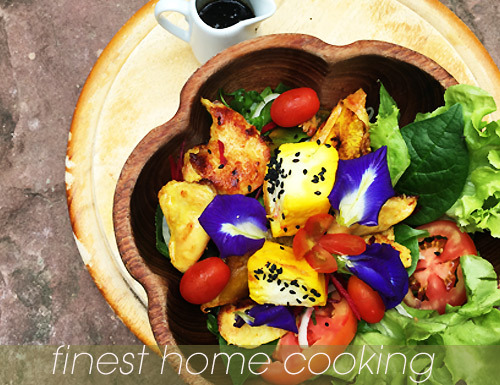 Unlike other standard hotels, SEA Harmony Eco House offers you truly "home" feeling - you can get local & tourist info direct from us, enjoy homegrown & home made cooking, soaking in warm welcome making you feel make you feel at ease. SEA Harmony uses natural resources wisely and only one place where your host, Node & Indy pay attention to small details from growing our own vegetables to serve on your table and making you feel like staying "home"
" Travel like local " from our real travel experiences around Hua Hin and Thailand, we could help you to travel like local and you can also read our stories and blog from our website. You can choose from our 5 boutique rooms where each room reflect its own character and designs. 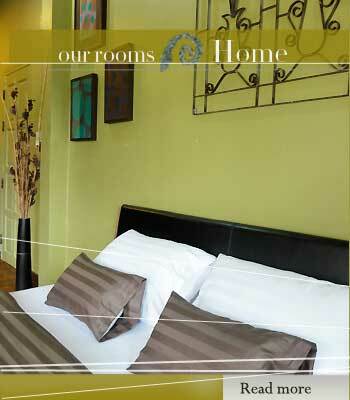 Find more about our room on our website. 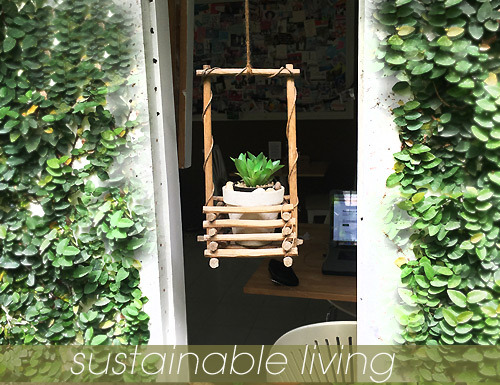 Planing your Holiday in Hua Hin and stay to a place like home at SEA Harmony Eco house by booking direct from our website you could get great deal from our website. Simply get our promotion code or contact us for the deal. Travel like Local ! your host Node and Indy travel around Hua Hin and Thailand giving you practical travel guide from our personal experiences. What to do? where to eat, how to get there we can help you. SEA Harmony is a boutique guesthouse B&B comprising of five guest rooms. Each room has a unique design with different layouts for each room. Each individual room presents its own character, this page will provide more details about our boutique room so that you can choose the right one for you. Our five en-suite guest rooms have been refurbished and we always renovate our house bringing you a comfortable home stay for guests, which soon become friends. From five different guest rooms, we offer four room types based on the floor and deck name – Top Deck (Amber room), Balcony Deck (InnWhite room), Promenade Deck (Cushy and Classic Rooms) and Lower Deck (Navy Room). The Navy room is located on the ground floor at SEA Harmony Eco home. Hand painted white and blue stripe on the wall of this guest room creates the feeling of a beach house. The wall shelves in Navy room displays photos and sea-inspired home decors. Our guests who stay in Navy room can also access balcony on the second floor. 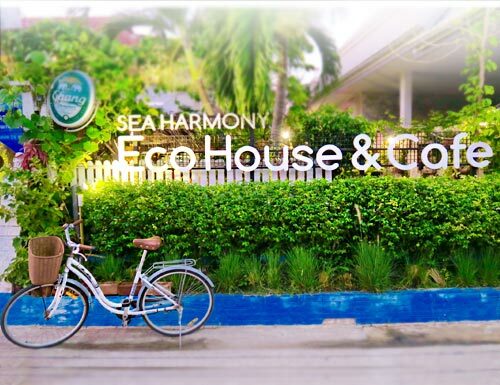 SEA Harmony Eco Lodge Bed and Breakfast Hua Hin, a real home away from home experience in the quaint seaside village of Khao Takiab - where you can truly relax and soak up the warm homey atmospheres by friendly hosts Node and Indy. All overlooking the mystical, iconic Khao Sanam Chai & Khao Takiab known as monkey mountain or Hua Hin Chopstick mountain waling distance to Takiab peninsula. With five different boutique unique rooms are great place for all travellers who looking for a charm, comfort, distinctive holiday home in Hua Hin/Cha am. 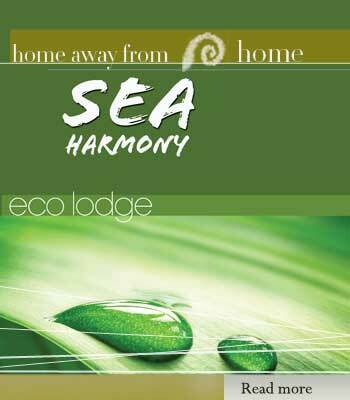 Enjoy local lifestyle with truly home atmosphere at SEA Harmony Eco Lodge. I guess before you are coming to Hua Hin Thailand you probably want to know a bit about background and information of Hua Hin Thailand’s royal city holiday destination. 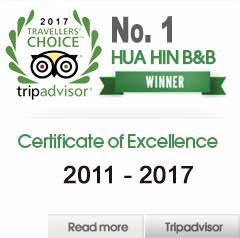 There are many websites providing very formal information about Hua Hin e.g. latitude, longitude, history and geological background. If you want to know these info about Hua Hin you can simply look up on Wiki or other websites. I understand that you are here to Hua Hin for holiday and you propably want to know more about tourist's practical information rather than reading on Hua Hin for your examination. "Huahin” pronounced “ Hua - Hin “ Hua in Thai means head and Hin means stone. Therefore, Hua Hin means “ Stone Head “ the name implies the geography of Hua Hin beach from that covered with rocks and stones. 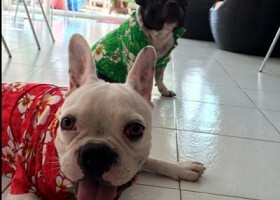 Why do you want to come to Hua Hin? To response to this question, firstly if you are a beach lover - you probably love Hua Hin. Pattya, Phuket, Khao Samui, Kho Chang, Khao Tao, Chon Buri, Rayoung and so on are Thailand’s top beach destination - why coming to Hua Hin ? There are many factors that making Hua Hin become Thailand’s undercover holiday destination. DO NOT come to Hua Hin if you are into scuba driving, snorkeling or boat trip - there are noting to see under the ocean apart from white sand and black rock . Indeed Hua Hin is the beach lovers’ destination - Hua Hin is more than a perfect location to relax rejuvinate yourself with sea breeze. Hua Hin is very close to Bangkok traveling only 2.5 hrs ( by car) and public transport is very extensive. Peacefulness - The best city if you come with your family. Bar girls or go go boys pubs, bars have been located in the designated areas so you won’t hear dup dup all night. Plus Hua Hin is a royal city where our current King and previous King stayed or used Hua Hin based as royal palace e.g. 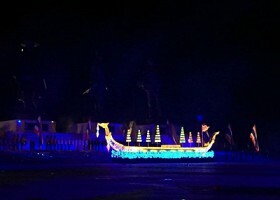 Khao Tao palce, Summer Palace of King Rama 6 and more! Love to Eat Love Hua Hin - from fresh seafood to bakery coffee shop or even local favorite foods you can find them all in Hua Hin. Gate way to South of Thailand - Hua Hin is beach capital and gateway to Thailand's Southern Ocean Destination e.g. Ko Samui and Ko Pha Ngan in Surat Thani Province, Pattaya in Chonburi Province, Cha-Am in Phetchaburi Province, Hua Hin in Prachuap Khiri Khan Province, Ko Samet in Rayong Province, and Ko Chang in Trat Province you can use Hua Hin as a Hub - ASK me if you want to know how to get there easily! Hua Hin = Relaxation with massage and spa - ask us( Node and Indy ) when you get here we will recommend you the best one around Takiab or Hua Hin. Thailand ’s Gay and Lesbian friendly holiday destination. There are many place for gay and lesbian to Hua Hin town - we have visit many places so we can recommend the right one for you ! When we are taking everything in to account, This makes Hua Hin become Thailand’s perfect holiday destination among Thais and soon will be more foreigners. Recently Thailand Tourism just launched a new short Video ( 1.53 mins) to recap the main attractions in Hua Hin. The charming night markets both Cicada and Chai Chat Huahin's original night market only short distance away from SEA Harmony Eco Lodge.
" Home " is one perfect word to describe our SEA Harmony Eco Lodge Bed and Breakfast. Our house has a distinctive character and personal touch as same as our website. 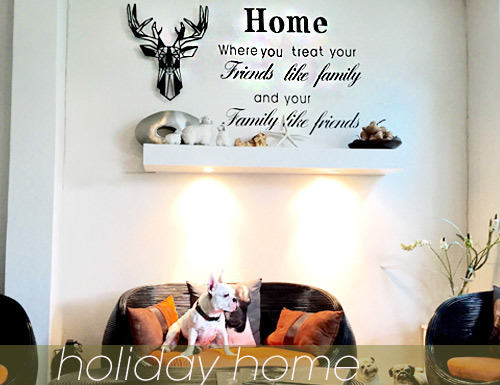 Indy and I have gained our travel & holiday experiences around Huahin, Thailand and around the world creating holiday home with friendly hospitality to our guests. 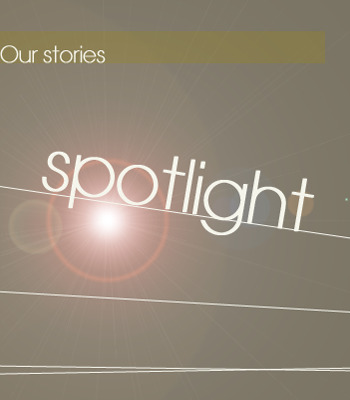 You can read H Blog where we are sharing our own traveling experiences e.g. Hua Hin Food&Drinks, traveling around Hua Hin, Hua Hin Hotels and resorts and more. On SEA Harmony website you can book room directly with us so you will be ensured to gain direct support from Node and Indy without mucking around with travel agents and more importantly with friendly rates. Do you need us to planing your trip? We can help you organize your Hua Hin trips while you are staying with us. 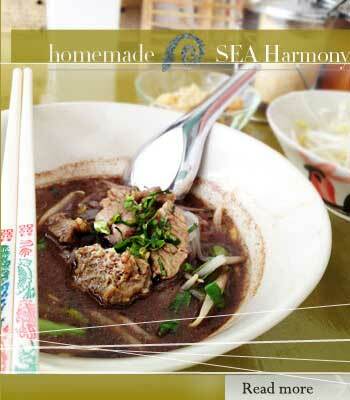 SEA Harmony Eco Cafe is our food & drinks and socializing hub for all who love delicious healthy dishes. We use our organic vegetables for our garden and local supplies as a key ingredient. While you are staying with us at SEA Harmony, we could help you to plan your trip to many places to suit your lifestyle and interests from local with real local experience (Indy and myself). 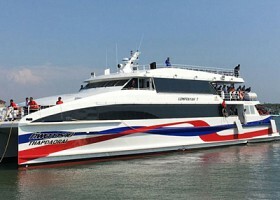 Hua Hin is very accessible by all transport type e.g. car, taxi, train public transport and plane. There are more than 3 mini bus companies service from Victory Monument Bangkok, South terminal or Mor Chit Bangkok bus terminal to HuaHin City Center. it’s cost about 180 B one way. Most of Buses or Vans you drop you off at Hua Hin Clock tower near Hua Hin Temple. From there you could take the green mini bus ( Song Teaw ) on the same side of the Clock Tower and make sure it ’s Green Bus and it will be terminate at Khao Takiab coz there are many colour of buses go different routes. The public green bus usually take around 20 - 30 mins to our guesthouse. To get off the bus you just bus the bell on the bus and allow approximately 2 mins for the driver prepare to stop. The bus will pass Amari Hotel on the left and after about 400 meters keep looking on the right and get off at “ Takiab 6"
MINIBUS = VAN = Mini Van = they are all the same but call differently they are more than 4 diferent Van Companies and they are terminated diffrent locations. Van is quick which takes less than 3 hours. Therefore, when you are referring “bus” make sure you specify more details to prevent your misunderstanding! Travel by train seems to be the cheapest option and the negative side is train in Thailand always DELAY. If you are booking third class train, you would experience your bum soared due to hard-wood seat, crowed passengers and massive delay ( because government offers free 3 rd class Train ticket for Thais) . It can be take up to 6 hours depend on your tickets and unexpected incident! I found that this is very comfortable and reliable service compare with other option above. You could book it online and plan your trip ahead! There are only a few services flying to Hua Hin and these services have been changed very often, I think I won’t mention this option too much. Also I have found the website of Hua Hin Airport is useless. Here is the link http://www.huahinairport.com and let me know if you found the website useful ! I think this option is the most convenience but it would be a little more expensive than public transport. Taxi from Hua Hin to BKK or vice versa cost around 1800 - 2500 B depend on the company and taxi types. I will write more about Taxi Services later as there are a lot of factors to be concerned. If you wish us to arrange taxi for you with Hua Hin Taxi Company please contact us 48 hours in advanced. Just incase you are driving to SEA Harmony. You can get the navigator from google map to our house. From Hua Hin City you are keep drink about 10 mins before Fly OVER Bridge turn left to Takiab Village then continue driving about 1 KM looking the sign on your right “ Takiab 6 “ Then turn right to our guesthouse. If you are taking the taxi the from Hua Hin city and train station, the easiest way is tell the driver to go to SEA Harmony Takiab 6 OR pass my telephone number to the driver I will deal with the driver . The standard price for the taxi is round 150-200 B depend on the type of vehicles and your negotiation skill! NOTE : Taxi in Hua Hin is not the same as Bangkok Taxi meter. It’s more like personal car with little sign on the car or pick up car with the roof. Hua Hin has so many things to do. If you are choosing to stay at SEA Harmony Eco Lodge Bed and Breakfast, make sure you allow your full day long exploring around Takiab Village. There are many places to see in walking distance please refer to our video guide, Kascha will take you around the Khao Takiab Village. If you are planing to travel outside of Takiab Village, here is more info for you. I have found that this list on Tripadvisor list is not really making senses for number of reasons. Firstly, Paramotor Hua Hin is not really tourist attraction, it 's quite confusing.In fact, It's just commercial leisure and activities in Hua Hin downtown! Number two and three on the list are golf club and Black mountain water park are not Hua Hin attractions. Indeed, this list is really about business listing directory in Hua Hin! Literally I think SEA Harmony Guesthouse would have been one of tourist attraction on this Tripadvisor list, just need you guys to write reviews on it. Therefore, I am making a new list based on my personal and my guest experiences and its proximity from Hua Hin downtown as well as from our guests who shared their stories on the internet and Tripadvisor. Let's rewrite a new list of " SEA Harmony Hua Hin's Top Attractions"
1. Khao Ta Kiab Beach and Mountain : Only 3 minutes walk from SEA Harmony Guesthouse you can easily access low key and clean beach that you can really swim. Form the white dandy beach you can walk to Khao Takiab mountain and fisherman village only take 15 mins along the beach.There are a lot of things to do in this village, to help you to find the places. Here is the checklist thing to do in Takiab Village. 2. Cicada Market : The charmest market in Hua Hin open only weekend hight only 20 mins walk from SEA Harmony Hua Hin guesthouse.3. Hua Hin City Market: This is an original night market in Hua Hin open every nights from 6 pm to mid night. 3. Hua Hin downtown and night market: Hua Hin Town is in fact the oldest beach resort of the country and is still as popular as ever. The town used to be a quiet fishing village into a popular beach resort. Today Hua Hin downtown is busy with tourists and locals who want to enjoy the beach and city lifestyle. The busy and crazy beach is near Hilton and Dusit Thani Hotels and just opposite the main street you can enjoy a wild night life every night! 4. Hua Hin Rail way station: The railway station is recognize as the most beautiful train station in Thailand.The first major event which led Hua Hin to its prosperity was the construction of the southern railway line in the reign of King Rama VI (1910-1925), which was soon followed by the establishment of the Railway Hotel and the Royal Hua Hin Golf Course. But the most important of all was the construction of the summer palace by King Rama VII in 1926 which he named Klai Kangwon Palace (meaning "far from worries"). From then on, people have kept flocking to this newly-discovered seaside resort to enjoy their holidays, especially in the hot season. 5. Floating markets : There are two floating markets in Hua Hin, Hua Hin floating market and Sam Pan Nam Floating market.The choice is yours but don't expect too much about those market. I would says it'sjust shops a long man-made pound that's all! 6.Hua Hin Hills Vineyard: Hua Hin Hills is part of Siam Winery the same company that produces SPY Winecooler. There is a nice restaurant that you can appreciate relax atmosphere where grapes for Monsoon Valley Wines are grown and delicious foods. 7. The summer palace " Maruekatayawan: A beautiful functional, yet elegant, teak summer palace built on stilts. Massive living spaces and interconnecting walkways are raised off the ground at second storey level. The palace is surrounded by peaceful gardens with majestic mature trees. This summer palace was build for King Rama VI and his entourage when they decamped to his Hua Hin getaway. 9. Pala U waterfall : The fertile waterfall and great escape from busy life in Hua Hin. The water fall is located in the south of Keng Kajan National Park which next to Myanmar border. I went there when I was 17 year old and I remembered this waterfall well because my dad car was broken down in the middle of the hill. Pala U is about 60 KM away from Hua Hin downtown. 10. Elephant and Art Village: I have combined the last two places together coz it s not really far apart. I think I don't have to describe those place much as those names are quite self-explanatory. From 2014 There will be more commercial tourist attractions and theme shopping center and water park in HuaHin. Stay tune with us we will update you more details. Cicada Night market area : There are many restaurants and cafes around Cicada Market where you could find Thai food, BBQ, SEA Food, Issan food and international food e.g Italian and Japanese. Aslo Cicada Night has many food stalls in the market that open from Friday Night to Sunday night. I am going to put more details and photos of aforementioned restaurants on my website or If you are staying at SEA Harmony we can sit down and give you more details so you can eat and choose your own restaurant like local people here. The best way to get around HuaHin and visit most tourist attractions ? When are you coming only a one night you always thinking about going to many places and you don’t really have enough time to explore around. We can certainly help you to achieve your traveling plan in HuaHin. We have hand-on experience about traveling around so we can suggest you the best options for your HuaHin traveling. The best option is renting private taxi so you can customise your own trip without lookup on the map and let the taxi driver doing all the hard job for you e.g. driving to your destination, buy the tickets for you ( if required entree fee), looking up the route on the map or even find out more details of your destination. Just sit down and tell us where do you want to visit in HuaHin or even in Thalland and we will help your plan your trip and get the fair private Taxi cost. Which day is the best day to visit Hua Hin?? in HuaHin for example HuaHin's Tourist attractions ( especially Cicada night market, HuaHin Winery and HuaHin PernWan Vintage Shopping Mall as well as most of restaurants and Cafes. This crowed cost your trip coz it may take you longer in the quque and more importantly services and outcomes never get right! .Here we having HuaHin travel tip for you. If you are not working on Manday then come to HuaHin on Sunday, this because most of accommodations e.g. Hua Hin hotels ,resort, guesthouse and hostel are cheaper! Most of hotels and resorts apply their weekend rate on Friday and Saturday night so Sunday is cheap day for you. Also you still get weekend activities going on on Sunday night but less visitors. Traffic is not too bed in Hua Hin and TaKiab because you are traveling against the traffic! Friday is a good day in HuaHin as most of people travel to HuaHin on Saturday. A: There are many websites where you can book our rooms with your prefered options and room types. Some of website offer room only, some included breakfast. If you compare the same room type with breakfast, our rate is friendly direct rate. If you find other website cheaper than us we can beat the price for you. Q: What's our rates and availability? 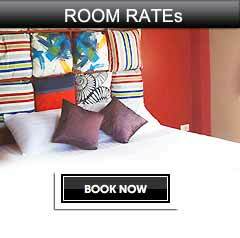 Check on our reservation page our rate is real time and you can book instantly. Q: Airport pick up or taxi service? A: We can arrange taxi for you and we require 24 hours to confirm your booking with Hua Hin Taxi Company. The price depends on the type of vehicles and number of passenger e.g.